On January 13th one man hit a button that triggered an event to be known as the Hawaii false missile alert of 2018. Without a sense of what kind of shelter to take, where to go, or what to expect – the message became an instant source of panic and confusion for tourists and civilians of Hawaii. It took the Hawaii emergency management agency forty minutes to retract the false alert and resolve the problem. After all the confusion was settled people started to wonder what the hell happened? It wasn’t long before the media revealed that a singular man had made the mistake of hitting the ‘false’ missile alert button. It didn’t take much longer for conspiracists to start questioning. Have you ever been thrown under the bus for someone else’s problem? If you believe this conspiracy theory you’ll probably agree that this worker pulled a pretty epic short end of the sick. 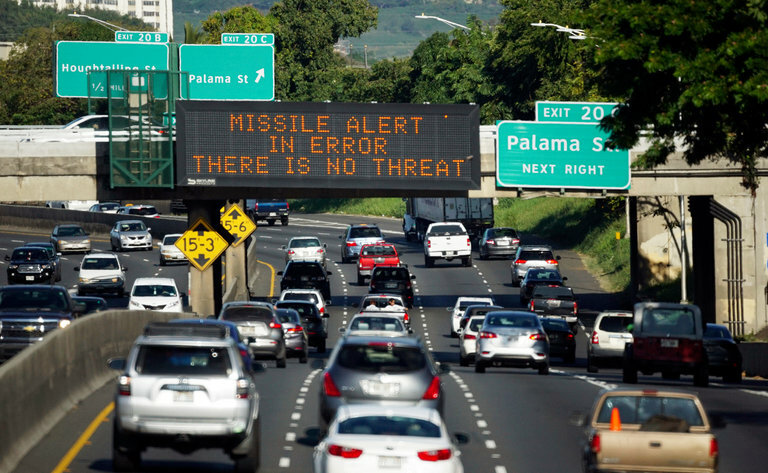 Hawaii False Missile Alert or Intercepted Ballistic Missile? Conspiracists believe North Korea successfully launched an ICBM (intercontinental ballistic missile) targeted at Hawaii. However, America’s THAAD (terminal high altitude area defense) anti-ballistic missile system took it down in the upper atmosphere before it had a chance to inflict any damage. However, this is where conspiracists get divided. Why still issue the alert if the THAAD system was successful? Why let something as stupid as 2018 Hawaii False Missile Alert go down in the history books? Some say it was to test out how people would react in the event of an actual missile crisis. Kinda like the ol’ Project Blue Beam theory we’re so familiar with now. Hawaii is a small, controlled environment thus perfect for studying behavioral aftermath of such an event. Others believe the alert was actually necessary to issue to Hawaii, just in case of any failure. Which means that the Hawaii emergency management agency employee didn’t hit the button by accident, he hit the button to trigger the alert system purposefully because he was informed the situation was not a drill. Something doesn’t seem right about this employee’s mistake. Firstly, the Hawaii emergency management agency originally came out and said their worker had “accidentally” triggered the system. It was only after the media got a hold of this worker, interviewed him, and published his side of the story that the Hawaii emergency management agency then made a statement saying this worker “had a history of confusing drill and real-world events.” A vague statement that seeks only to purposefully explain further this particular employee’s behavior while not addressing why someone with this supposed history would even have access to an alert system in the first place? Conspiracists go on to explain that the government needed a scapegoat because they had to keep the reality of a nearly successful North Korean missile attack under wraps. Why? You’d think if North Korea successfully reached U.S. air space that America – Trump in particular – would be ecstatic to retaliate. Some conspiracists believe the military chose to keep this under wraps to avoid panic, to buy themselves time for a more calculated counter-attack, or quite simply to use the false alert system as a distraction to keep the real situation a secret from Trump – avoiding any of his overly crass decisions. Other conspiracists suggest that the American military kindly decided to avoid political conflict and full-on ballistic warfare until the South Korean Olympics ended. Because if any major military or political move has to be made – for godssake, let the Olympics happen first! The Olympics have ended. The chatter behind the Hawaii false missile alert has subsided. The unnamed employee has taken the fall. What happens next? Whether you believe the Hawaii false missile alert to be truly accidental or not, the system is in place for a reason. 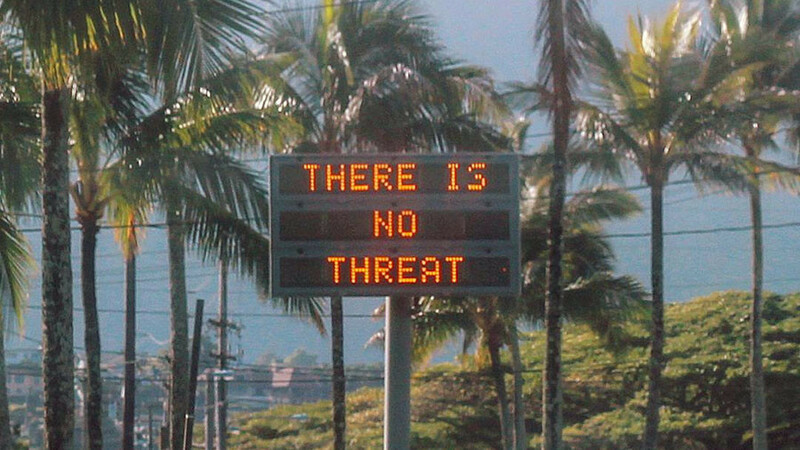 Will the next missile alert be unequivocally real?